"I want to give you my overall impression of your work: You have a terrific writing style. I can tell that you have done much planning and preparation in crafting your work – especially the way you have thought out the characters and movement that happens in the story. This is not an easy feat. Your prose is very nicely written with details that capture the reader. Right from the start your plot was very engaging and I found myself really connected with what was going on. It is easy to have too much going on too soon – not in your case. Your plot is slow and methodical and you use your dialogue to move the plot along. With that being said, you really do a nice job of slowly making your way through the story with details and a certain voice (yours as the author) that allows your reader to really interact with the characters (who are all round and very nicely developed). Your characters are lifelike and I love it when I leave a story feeling like I know them. You have a realistic plot and to me that makes for an enjoyable story. You have crafted a quality piece of writing. Bravo!" My work is done and the book is in production. According to my publisher, VULCANIUM will be available this Autumn. The final layout is 6.14 X 9.21 inches; hardcover with color dust jacket; 382 pages of text; one illustration, plus the jacket images. Where I had a say in the printing process (paper quality, binding, etc.) I chose the best they had, so I’m expecting a nice book. 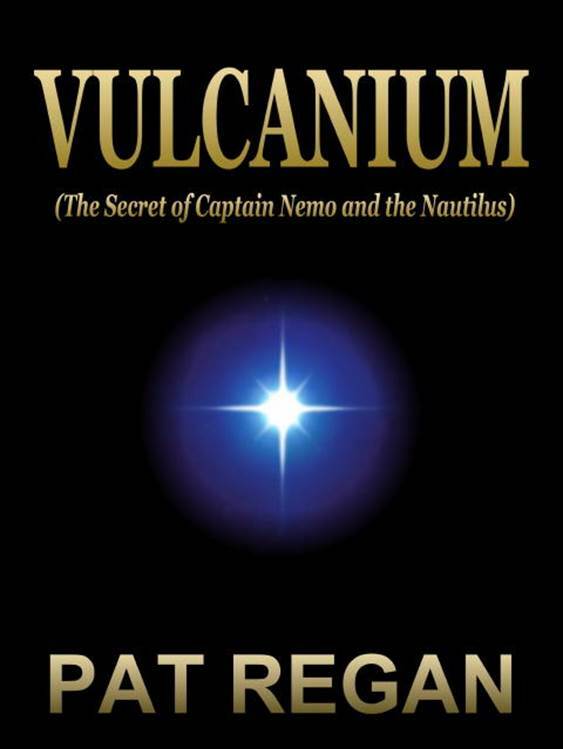 The second book in the series is entitled VULCANIUM II (20,000 Leagues Under the Seaquel) and would be finished right now if not for the extra work of publishing the first book. The manuscript for VULCANIUM II is written and copyrighted; I’ll be polishing it up a bit and expect it to be published by the Spring of 2014. 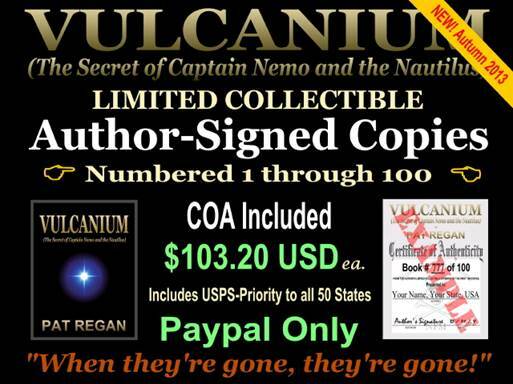 VULCANIUM III (Beyond the Mysterious Island) exists as a complete storyline and the print manuscript is about 40% rendered in prose. Still some vignettes to be written there, so I’m expecting that one to become available by this time next year: Fall, 2014. ONLINE SALES: Amazon / Barnes and Noble have both stopped offering discounts and are charging retail price as of this afternoon; I’m told when they stop offering incentives, it’s selling well. Full price, but you still get free shipping. SIGNED COPIES: My publisher is imposing huge UPS shipping charges that defeat my ability to order and sell my own book; it’s actually better for me to buy online like everyone else. But I have people I want to gift with copies, and others have asked for signed copies, too, so I’m still working on it. 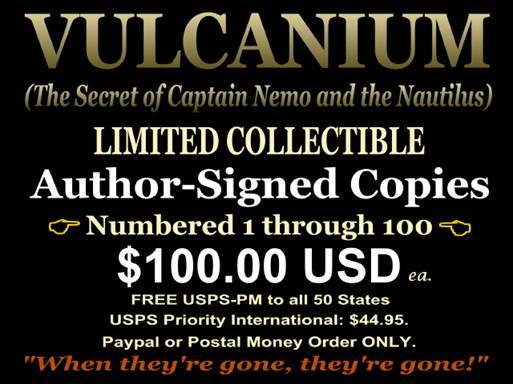 At considerable expense to myself, I have imported 100 copies of VULCANIUM to Hawaii. Some of these books are intended for gifting, the rest may be sold. Due to the shipping expenses I’m incurring from my publisher, this is the only signed copy I plan to release; the price includes a COA and free USPS Priority Mail to all 50 States of the Union. When the books arrive next week, I’ll reply to those on the list to arrange payment and shipping. Don’t send me any money until I email you a payment request; forfeit at that time and I’ll have to delete your name from the list and move everyone else up. Any books that don’t sell by the time I decide to end to this offer (my choice) will be reserved for future gifting or possibly sold through other venues. If you want one, don’t wait. I’m not in the book selling business and I don’t have time to be. When I pull the plug those on the list will have an opportunity to make payment and receive their book. After that, the offer is null and void. Having read and understood the above: Friends wishing to apply for a spot on the list for this limited signed, numbered collectible should submit their name and shipping address via email through the link below. SEND NO MONEY AT THIS TIME; YOU ARE ONLY REQUESTING TO GET ON THE LIMITED COLLECTIBLE LIST. Copies #001 through #023 are gone. #024 through #090 are still available and will be assigned in order requests are received. The first shipment of 40 arrives a week from now: on Tuesday the 29th; I’ll be finalizing the list and proceeding to process books then. Tom is a friend from the 1970’s and 80’s back in Benicia; one of our crew (the original “Vulcania Volunteers”) that helped me acquire the lumber with which we built the first VULCANIA SUBMARINE facility in California. Tom tested some of our earliest experimental rebreathers in our pool during the 1980’s; and helped with our seventh float test back in 1991. Tom was so big we called him “Two Step” because for every step he took, most people had to take two. He is one of the best people I have ever known; a heart of gold, for sure. A few months ago, I learned Tom suffered a stroke and is almost totally incapacitated; he can barely speak. I called his mom today and told her I was sending him a book. She said he would have a hard time reading it himself, but she will read it to him. And that gave me an idea. 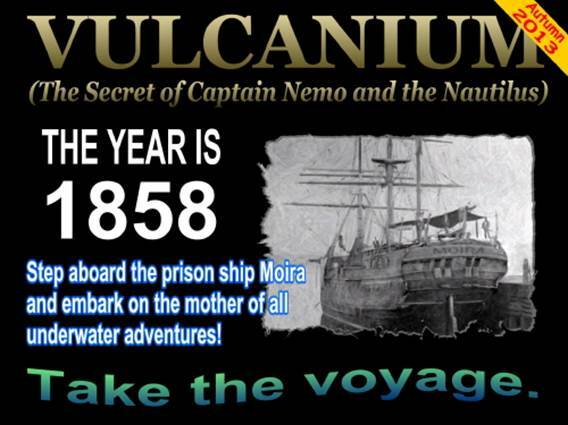 I’m reading VULCANIUM into a digital audio file for Brother Two Step. I might give some copies to friends, and I’d like to make it available for other incapacitated people, too. VULCANIUM SHIPPING, MULTIPLE, INTERNATIONAL, ETC. The orders coming in raise a few questions that need answering. SHIPPING: I’m still offering free USPS-PM shipping to all 50 United States of America. I can fit up to four books in one box; and yes, the book numbers will be in sequence. International customers pay shipping, customs duties, and taxes, if any. The good news for our International friends is: books are usually duty free. But in the end, International Customers are responsible for shipping, taxes, and duty fees, if any. Sorry, but it’s not my world. 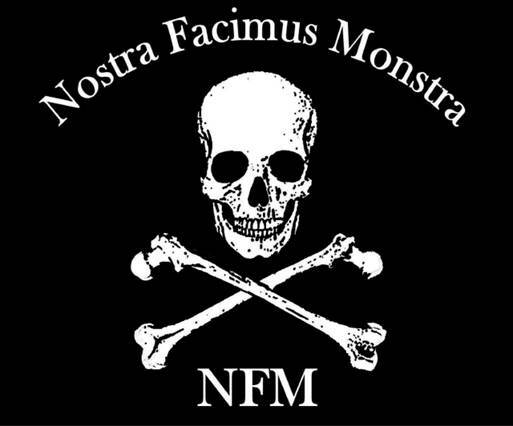 PUBLIC NOTICE: All versions of the NFM Logo: comprised of a skull and bones image, with the phrase “Nostra Facimus Monstra” and/or “NFM”; and the phrase “We make our own monsters”; are the intellectual property of Pat Regan and are protected by copyright, trademark, and design patent pending. Unauthorized use is prohibited by law. Hopefully, that will provide uniformity and make the signature page look a little better. I’ll fill in the actual book numbers by hand and sign below the stamp. The print shop said they can make the stamp while I wait, so hopefully this will be done by early next week. Then I’ll contact people on the list, arrange payment, and start shipping books. If you’re interested in this offer, contact me by email without delay. I’m moving on to other projects and, unless something else absolutely requires it, this should be my last post on the subject. © ® ™ Pat. Pend. The books are in and going out. As of the time of this writing, the first 27 are spoken for; next customer will receive Book # 028, subject to change without notice. Amazon is listing it as temporarily out of stock and has orders waiting since Nov. 9th. I’ve contacted them and been advised they put in their order to the publisher on Nov. 13th. If you want to buy from Amazon, I’d recommend putting in your order now. Wait for the “in stock” notice and you might end up waiting for their next bulk order. This collectible is the only signed offering I’ll be able to make. I am no longer offering it to International customers because my local post office does not stock USPS PRIORITY INTERNATIONAL packaging, and I’m advised it will take me six weeks to bring them in to Hawaii. I will provide alternative packaging for International customers with orders pending at this time and ship by USPS PMI; but once those orders are shipped, I won’t be accepting any more International orders until the packaging problem is resolved. Until further notice: USA sales only; PAYPAL only. 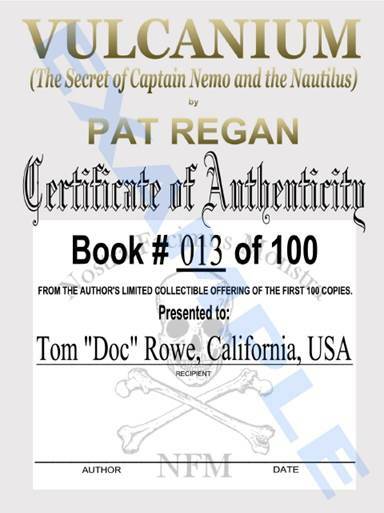 The collectible will make a great Holiday gift for most who are interested in SCUBA diving, manned submersibles, deep sea adventures, diving helmets, Science Fiction, Jules Verne, or 20,000 Leagues Under the Sea: perfect for the “Captain Nemo” in your life. If you want one, click on the image below and send me an email. I’ll get back to you ASAP. AMAZON UPDATE, COLLECTIBLE SHIPPING, ETC. The Collectible List is presently at book #028. Fourteen books that were scheduled to ship today (including two International orders placed before I suspended those operations) will be shipped tomorrow due to life priorities. I’ll send you folks a tracking number as soon as I have it. Four additional books will be shipped Friday. Thanks to everyone for your interest and patience. Amazon.com has been listing VULCANIUM as “temporarily out of stock” since the 10th; some have written to say they are waiting for the “in stock” notice to reappear. I knew multiple orders had been placed, so I wrote to Amazon and my publisher. The bulk order Amazon placed on the 13th came in this morning and pending orders were filled. Now they only show one left. My advice if you want to buy from Amazon is: don’t wait for the “in stock” notice. When the books arrive they are going out to those with pending orders, and that seems to be eating up the in-stock supplies almost immediately. If you want one in time for the gift-giving season, I’d say put your order in without delay. That seems to be the fastest way to get them from the online sellers. I wanted to ship to my International customers via Priority Mail but we’re having problems with that (see Nov 17th post above). When I go down to ship books tomorrow, I’ll try for other USPS International options. Hopefully I can work it so reliable, rapid, and insured shipping with a tracking number is available at lower costs. AMAZON HAS BOOKS IN STOCK; INTERNATIONAL CUSTOMERS; ETC. After writing to my publisher, Amazon received a shipment that was absorbed by existing orders; a second order arrived and was sold out in less than 24 hours; a third order came in and presently has 7 books left and they say more are on the way. They are only offering a 5% discount on the $27.95 cover price, and free shipping is only available on orders over $35.00. That would indicate they are selling well and have been receiving single orders for multiple books. 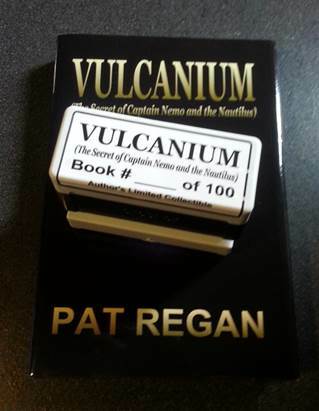 Bottom line: VULCANIUM is in stock and available at Amazon. Barnes and Noble has it in stock at the cover price, but with free shipping for single book orders. If you want ‘em, they’re available. I shipped two International orders for the Limited Collectible from Hawaii yesterday: whereas USPS Priority International was $44.95, yesterday it suddenly became $59.95; cost me about $120 to ship two books. If I continue to offer the collectible Internationally, I’m going to have to find alternative shipping methods. I like Priority because it’s fast, reliable, and has tracking and insurance; but those prices make it unfeasible. Looking into that over the next few days; more when I know. I have four more of the collectibles being packaged today and they will ship tomorrow via USPS PRIORITY Flat Rate Box to the USA. I’ve received reports that the boxes are being damaged in transit but the books and certs are coming through OK. I’ve come up with better internal packaging, however, and believe I can provide even better protection for the books during shipping. Well, I figured I should write something here and, not being afflicted with paraskevidekatriaphobia, I guess today is as good a day as any. VULCANIUM is finished and marketed, so I've created a page for it in the Projects Department here at VSC and won't be making any further announcements about it on the Chalkboard. If you want to buy it, Amazon or Barnes and Noble seem your best bet. The general offering of author-signed copies with COA by email order will end December 31, 2013; after which I plan to offer the remaining copies at a local book signing event, diving equipment shows, auctions, etc. Speaking of the Chalkboard pages: looks like I'll be starting a new one for 2014, since this page pretty much got devoted to the book, which was my primary involvement for the last couple years. The new page will be entitled Chalkboard IV and probably make its debut in early January. 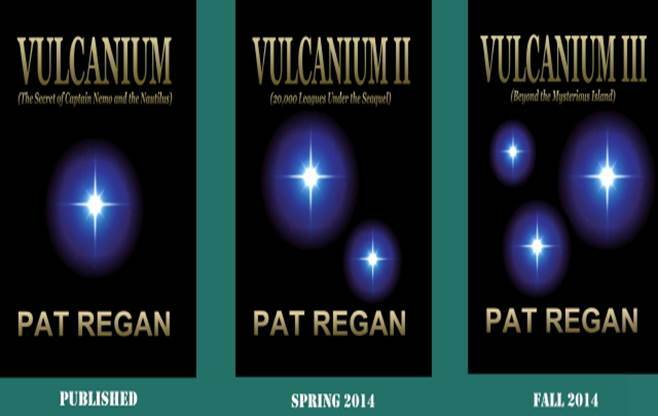 Now that VULCANIUM is published, I'm finishing VULCANIUM II and expect to have it published by Spring of 2014. But this time it's not going to be my "primary involvement" to the exclusion of all others. NEMO IV (my fourth Nemo helmet, begun years ago and sitting on the shelf since then due to priorities) is back on the workbench and will be finished and diving soon. Likewise, I have another Crowntop Crew Diver helmet I started years ago and will be working on that simultaneous to the N-4. And while I'm set up to build helmets, I'm starting the Baldy II and casting a half-dozen or so aluminum replica Nemo rifles. As usual, with all the other projects I have going on, work to refurbish the Nautilus Minisub has been slow but next Summer I'd like to get it into the water with five fully-equipped Leagues divers for another video event here in Hawaii. There's been a bit of auction action of late, involving 20K diving helmets and such. I'm not involved with any of that but people like Leon Lyons have asked if I plan to auction off (or sell) any of my equipment: either the authentic gear I restored or my functional replicas. I'm not inclined to part with any of my collection but the idea has crossed my mind. I was thinking of offering a complete Crowntop Crew Diver "Jake" consisting of an authentic helmet and boots with COA from Disney; correct replica brown rubber drysuit; a correct duals rig with the right kind of tanks, regulator, and one of my replica fairings; correct harness, pony bottle, belt, knife, gloves, and replica underwater rifle. It would be completely diveable but sold as a display only unless someone wants to receive training and get signed off to dive it. (I could also offer a complete Nemosuit but it would all be replica stuff and the tanks wouldn't be the vintage type because they're practically unobtanium.) If anyone has any serious interest in that they can give me a shout. I'll consider cash offers and/or trades for interesting things of value: cars, motorcycles, boats, property, etc. And in 2014 we're also planning a return trip to the mainland to spend some time with friends and take care of a little business. So anyway, it's been a great year for us here at Vulcania Submarine; 2014 looks like it's going to be even better and we hope it will be a good one for you, too. Here's wishing you a Merry Christmas and a Happy New Year! Until then, Aloha O'e from Vulcania. The weather's been beautiful but I've only been swimming / diving once in the past week because there's been so much work to do. Today I'm reorganizing the shop and tonight I'll be doing the same in the computer area. I'm only finding the time to write this because I'm face-deep in a plate of ravioli and I get bored just eating. I was kind of hoping the VULCANIUM series would be my last foray into writing for a while, but as I go through boxes of paper files and CD's in storage, I see I've got several other books that only need to be edited. The topic that looks most promising (as another book) is about the early days of what's now called "Canopy Relative Work" skydiving; I used to jump with the two guys who started it and the true story of what really went on back in the 1970's has a lot going for it in terms of reader interest. Those were some "wild and crazy" times and people seem to dig hearing about stuff like that. 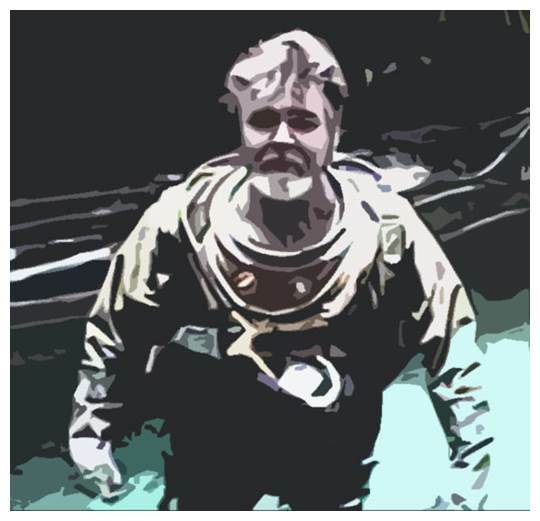 Another topic I doubt I'll publish on paper but which would make a good addition to this website is a history of the online communities that have formed around the genres my creative work falls into: Homebuilt Submarines, 20,000 Leagues, the Disney Nautilus, etc. Since the mid-1990's, I've been keeping accurate documentation in the form of written letters, email, preserved threads from Website Discussion Groups, and the like; I do believe it would be in the best interests of the global information sharing communities to publish it for the sake of dispelling many misconceptions that have developed over the years. A good title might be taken from a phrase Harry Hamilton (ndp: Hathorne) once used in an old email I came across last night: "Truth Squad." The intent of Truth Squad would be to disclose the facts about "who's who and what's what" in said communities by sharing the actual written words and statements of those involved; as expressed to myself and others over the years. If you think you know what's going on, you might be surprised to find much of what you know is wrong. Truth Squad (might change the title; not sold on it yet) isn't something I feel like taking a long time to publish, but I could present it by degrees on The Leaguer page here at VSC. That way I could do it at leisure, a bit at a time, when I'm kicking back; and without taking time away from significant projects. Just an idea so far, but I do see a need for it so I do believe I'll make that happen, starting in 2014. 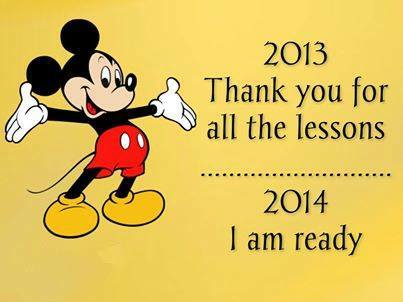 Stand by, folks! The Truth Squad is on the way! Anyway, that plate of ravioli is history and I'm back down in the shop. Y'all have a great day and "Keep on Leaguin!"